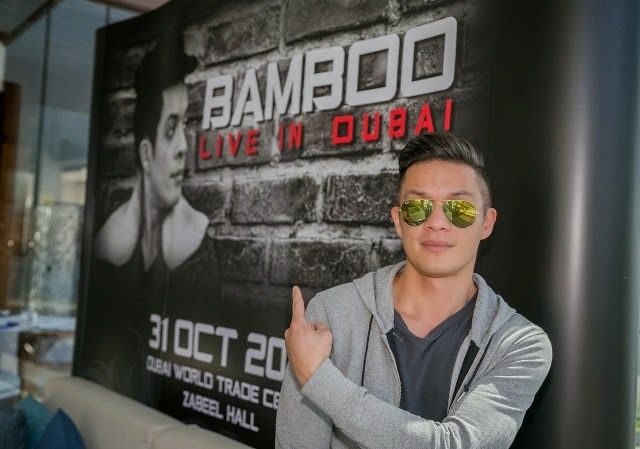 Rock Icon Bamboo will be in Dubai this Friday October 31 to bring down the curtain on his 2014 World Tour at the Dubai World Trade Centre. The Halloween schedule with his Dubai fans is a fitting finale to a tour that has seen the award-winning singer and star coach on ‘The Voice of The Philippines’ take his own brand of music to fans in the Middle East, Europe, Japan, USA and Canada. It will be the 6th time the star - former singer with ‘Rivermaya’ as well as his own eponymous band ‘Bamboo’ - has played in the UAE. And the man idolized by millions of Kabayans both at home and abroad, is promising a great show, produced and promoted by Dubai’s Spicy Lemon. It will be the 1st of two shows in a week for Spicy Lemon - 7 days after the Bamboo show, the Dubai Duty Free Tennis Stadium will be the venue for a star-studded gig featuring popular Filipino rock/punk band Kamikazee alongside ‘Rivermaya’ and award-winning hip-hop rapping superstar Gloc-9 on Nov 7. Tickets for the shows are on sale now in all branches of Virgin in the UAE as well as online from www.virginmegastore.me. Tickets for the Bamboo show are priced at AED95 for standing and AED145 for grandstand seating, while tickets to see Kamikazee, Gloc-9 and Rivermaya cost AED95 (standing) and AED125 (grandstand seating). While Kamikazee & Gloc-9 – fresh from winning 3 awards at the 6th PMPC Star Awards for Music – will be making their 1st appearance in a Spicy Lemon-promoted show, for Rivermaya it's a welcome return to the Dubai after making their debut in the country 12 months earlier and who are celebrating their 20th anniversary as a band. Further information on the 2 concerts can be found at www.spicylemon.rocks.